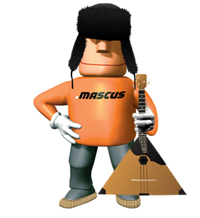 Mascus, one of the biggest market places in the world for the sale of transportation vehicles, construction machinery, agricultural, material-handling equipment and forestry, is delighted to announce a new operation in one of the most influential markets in the world - Russia. The company has signed a new licensing agreement with Pro-Machinery, based in Moscow. Mascus has had connections and online activity within the Russian market for some time through its portal www.mascus.ru but new partner Pro-Machinery will boost this presence with a local Mascus office and a team focused on promoting the brand across the country and helping buyers & sellers of used equipment and trucks from all over Russia. “Russia is a very important market for us. Not only does it present us with an important export market for the rest of Europe and Asia, but it also has important trading links with Japan and China,” explains Fredrik Larsson, Managing Director of Mascus. “By building a strong base in Russia with the co-operation of Pro-Machinery, we are reaching a much larger Russian speaking audience. Our portal allows buyers to talk to local dealers direct and allows dealers to offer their products to customers all over the world. It’s a major step forward for both Mascus and the Russian marketplace,” he adds. The Russian economy is recovering well after the global financial crisis and has both a large domestic market and a rapidly expanding export industry. Mascus hopes to consolidate both these areas into one, easy-to-use portal, giving both end users and dealers the opportunity to reach a much wider audience. Other countries such as the Ukraine benefit from trade links with Russia, and Mascus’ new portal in Russian will strengthen these ties considerably. Mascus (www.mascus.co.uk) - Is a marketplace for used farm machinery, forestry, and groundscare equipment and transportation vehicles. Product ranges include used tractors, used trailers, used trucks, diggers, box trailers, mini diggers and excavators. Mascus makes trading in used machinery and equipment quicker and more efficient by collecting in one place information about the supply and the demand. All dealers, producers, and end users are welcome to offer their used machines and equipment for sale via the marketplace.